The Presidential Campaign Organisation of the Peoples Democratic Party (PDP) has alleged that a former Governor of Lagos State, Asiwaju Bola Tinubu, is plotting to become the President of Nigeria through what it called the back door. It said the plot by the former governor, who is a stalwart of the main opposition party, the All Progressive Congress, was to take over as President of the Federal Republic of Nigeria in the event that the APC candidate, Gen. Muhammadu Buhari(retd. ), wins the March 28, presidential election. Director of Media and Publicity of the PDPPCO, Chief Femi Fani-Kayode, made this allegation at a press conference in Abuja on Friday. He nevertheless said the campaign team of the PDPPCO wished Buhari a long life. Fani-Kayode said skeletal information available to the PDPPCO suggested that the Vice Presidential candidate of the APC, Prof Yemi Osinbajo, was picked by Tinubu and 'forced to take an oath' to resign his appointment six months into the new cabinet, should the APC win the elections. After his resignation, the PDPPCO further alleged that the party would field Tinubu as his replacement and to wait for the health condition of Buhari to worsen to Tinubu's advantage. He asked Buhari to 'watch his back,' adding that the 'gang-up' against him and Nigerians was situated on the calculation that his health would deteriorate and lead to his death, paving the way for the expected 'new vice president' to take over power. Fani-Kayode said, 'It should baffle well-meaning Nigerians why Tinubu has decided to draft Buhari, despite his age, acrimonious background and questionable health status, into the presidential race whilst ensuring that his stooge, Prof Osinbajo, was foisted on the general as vice presidential candidate. 'The reason is that the PDPPCO wishes to use this forum to expose the ungodly plan by Tinubu to seize the presidency of Nigeria by subterfuge. 'You will recall how Tinubu wanted to be running mate to Buhari in spite of the nationwide resentment for Muslim-Muslim ticket that he and Buhari planned to foist on their party men and women. 'Senator Tinubu had justified the (planned) ticket by saying that competence was the important thing and not the issue of religion. 'But when he and Buhari could not push through the agenda within the APC, he (Tinubu), after been given the opportunity to nominate a vice presidential candidate, decided to prop up his stooge in the person of Prof Osinbajo. 'Now, the real reason Tinubu nominated Osinbajo has been made known to us and we hereby offer a public service to the Nigerian people by drawing national attention to it. Credible pieces of information at our disposal indicate that Tinubu has perfected plans to come to power through the back door. 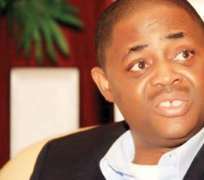 Fani-Kayode added, 'The ultimate objective of this plot is to ensure that Tinubu becomes President. The script is simple: given the questionable health of Buhari, Tinubu, who is desperate to be president for his own selfish reasons, will simply bid his time in the evil expectation that Buhari will not be able to go the whole hog. 'How wicked can those that hatched this plan be? How unfair can they be to the North, to Buhari and to Nigerians? We wish Buhari long life. Senator Tinubu's dangerous plan is about getting power. This is sad. No thoroughbred Yoruba man or indeed Nigerian wants to get power through the misfortune of another person.